When I think of Concord & 9th the first thing I think of is – turnabout stamps. I have always loved them, but could very rarely get them perfect. Well my friends, C9 has just released a few items that will help with perfect alignment, and I promise if you follow all of the steps, your projects will be perfect too! For those of you that don’t know, a turnabout stamp is designed so you can stamp in one color, turn your paper 90 degrees and stamp again with a new color and repeat for a total of 4x and the pattern aligns like a perfect puzzle. After all 4 turns are completed, you have a beautifully stamped image. It looks like it took a long time to create, but really once you get started it is very fast. There are some options too – you could choose to stamp the pattern only 1x or 2x or 3x instead of all 4x and/or you could choose as many or as few colors as you like. 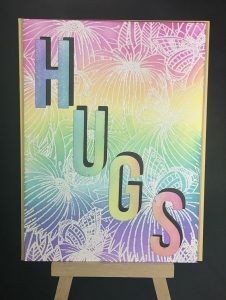 You can even get more creative by using embossing powders – the choices are all up to you. As shown in the videos, the alignment guides really make the prep work so simple. They are very inexpensive and save you tons of time! Also be sure to purchase the new jigs as well. You can purchase them separately or as a bundle. Now onto some fun examples! I hope you enjoyed my examples, and I hope they have inspired you to try some of these turnabouts on your own! Please share your artwork with me – I would love to see it!! Happy Crafting!